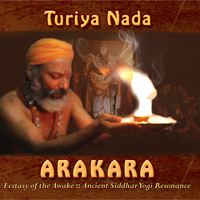 Cave of the Siddhars : Debut album by TURIYA NADA Purchase on Amazon Purchase on CD Baby Purchase on iTunes Enlightening resonance from the mystical roots of Mother India! For thousands of years, the sacred wisdom was transferred through the resonance of mantra chants as the most empowered “Shaktipat” awa..
For thousands of years, the sacred wisdom was transferred through the resonance of mantra chants as the most empowered “Shaktipat” awakening energies. Receive the blessings of awakening Consciousness. Siddhars represent the ‘other India’. A “Siddha” is a liberated, awake Being- a Yogi. As yogis journeying beyond enlightenment, after discarding organizational beliefs for direct experience, the Siddhars connect to the ancient lineage of Light. The potent, secretive wisdom of thousands of years was passed through resonance. Cave of the Siddhars represents the ancient blessings of consciousness through its uplifting resonance music. About Turiya Nada– Cave of the Siddhars is the sacred transmission of powerful and potent mantras and meditative energies that have been passed down through an ancient lineage of enlightened Sages, the Siddhars of South India. Accompanied by the didgeridoo, harp, singing bowls, djembe, udu, gongs, flute and other instruments, each track of Turiya Nada ‘s Cave of the Siddhars will take you on a mystical spiritual journey that will both delight and transform you! The Ultimate Consciousness Music!Cave of the Siddhars has calibrated at the level of enlightenment on the Hawkins Scale of Consciousness. – Combines powerful Siddhar mantra chants of the enlightened yogis of South India with the didgeridoo, harp and percussion. – Chants that have secretive and hidden for thousands of years even in most of India. – CD includes 12 page booklet including the chants and an insight into the mystical yogi traditions. – Enhance the depth, intensity and intent of your yoga & meditation. – Transform your inner and outer world by simply listening and enjoying Source energies! About Nandhiji: Nandhiji was blessed with an initiation through a multi death experience initiation by his Guru, aged 27- after which he took a plunge into the ‘other’ India as a yogi. He was graced by enlightened Masters, the Siddha Sages, who guided him through his journey of seeking. He spent the next decade in pilgrimages through the sacred vortexes of South India, caves & shrines and solitude. Through this seeking to attain wholeness as in Consciousness was the age old method of receiving the grace of his Gurus through the mantra deekshas and the discipline of a yogi. Ideal for a deep plunge within! It is a journey within through each chakra, finally opening the Third Eye, the Ajna chakra. Due to the powerful subtle energy and higher vibration in Cave of the Siddhars, it is natural to experience an extremely deep meditation and yoga practice. In yoga studios- track 3 & 4 for savasana, the final relaxation during yoga. The divine vibration of the Sages brings to our daily lives the gift of tranquility, love, integrity, inspiration, harmony and divine protection. This resonance is ideal for home… just listening wherever we are or simply allowing the hyper-positive vibrations to bring in its goodness! Track One:Dance of the Siddhars–The awakening! Track Two:Siddha Joy– Awaken the Goddess Invoke Mother Kundalini as “Sarva”, the cosmic oneness “Mangala”, auspicious presence. Track Three:Siddha Intensity– Journey through the awakened chakras as in joys as flame in union. Climbing above to the peak. Ascend climbing above to Be! Track Four:Cave of the Siddhars– The infinite joys of being One. At the peak. nada beyond the mantra resonance. Enjoy the ancient meditative grace that flows with our joy!